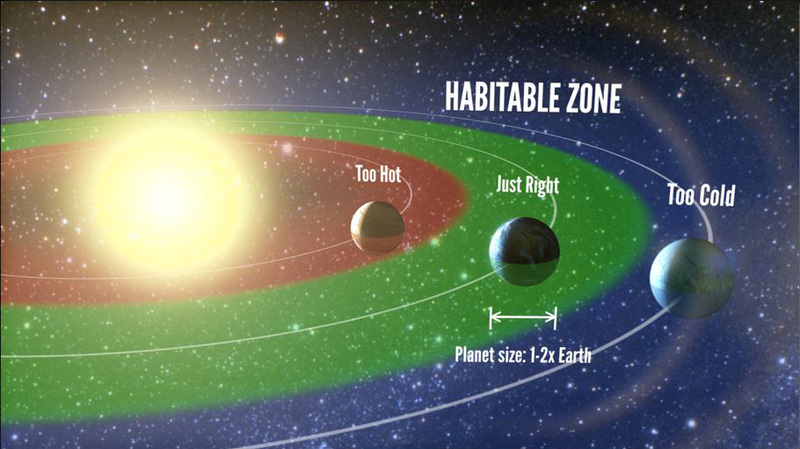 The habitable zone corresponds to the range of orbital distances where liquid water can exist on a planet’s surface. Credit: Petigura/UC Berkeley, Howard/UH-Manoa, Marcy/UC Berkeley. How common are planets like Earth? That’s been a question astronomers and dreamers have pondered for decades, and now, thanks to the Kepler spacecraft, they have an answer. One in five Sun-like stars in our galaxy have Earth-sized planets that could host life, according to a recent study of Kepler data. “What this means is, when you look up at the thousands of stars in the night sky, the nearest sun-like star with an Earth-size planet in its habitable zone is probably only 12 light years away and can be seen with the naked eye. That is amazing,” said UC Berkeley graduate student Erik Petigura, who led the analysis of the Kepler and Keck Observatory data. The Kepler telescope’s mission was to try and find small rocky planets with the potential for hosting liquid water and perhaps the ingredients needed for biology to take hold. For four years, the space telescope monitored the brightness of more than 150,000 stars, recording a measurement every 30 minutes. For a recent focused study, scientists concentrated on 42,000 sun-like stars (G and K type stars), looking for periodic dimmings that occur when a planet transits — or crosses in front of — its host star. A team of scientists from the Kepler mission and the Keck telescope in Hawaii have announced that from that survey, they found 603 planets, 10 of which are Earth size and orbit in the habitable zone, where conditions permit surface liquid water. Since there are about 200 billion stars in our galaxy, with 40 billion of them like our Sun, noted planet-hunter Geoff Marcy said that gives us about 8.8 billion Earth-size planets in the Milky Way. This entry was posted in Exoplanets and tagged earth-like, exoplanet, exoplanets, kepler by Thomas. Bookmark the permalink. Copyright © 2019 Space Sparklings . All Rights Reserved.